This is the gravestone of my great-great-grandfather. I didn't know he was a Mason until I stumbled upon his gravestone while looking for his son, who is buried elsewhere in this cemetery. I know that his father was Capt. 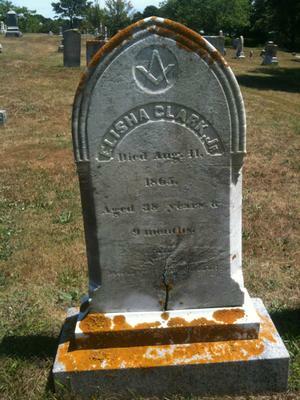 Elisha Clark, who is also buried in this cemetery. His son, my great-grandfather, eventually owned a dredging company and lived comfortably. No G in the middle of the square and compass. Thanks for sharing this with us, Rebecca!